Tool-grinding Machine ZS350 is intended for the manual sharpering of cutting knives of the nail-making machine or knives of the same type. 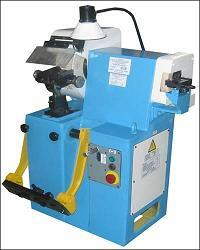 machine cutting knives and thus promotes obtaining of articles with a fine-tapering point. The spindle of the tool-grinding machine, installed in the rolling bearing, is drived by electric motors via V-belts. displacement can be fulfilled with the help of a manual regulator-dial. wearout. The sharpering is fulfilled in displacement of the table by the guide bar. A set of accessories is delivered with a tool-grinding machine.